Source: Radio Frequency Systems, Inc. Constructed of corrugated foam-dielectric copper cables and Spinner connectors, FLEXWELL foam-dielectric jumper cable assemblies are usually used between main feeders and antennas or from main feeders to transceivers. Available in one, two and three meter lengths, these cable assemblies are manufactured using a factory-automated process. This process involves soldering the inner and outer conductors of the connector to the inner and outer conductors of the cable. 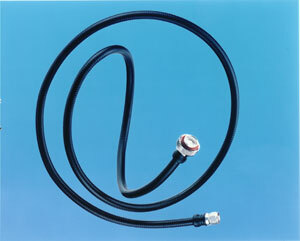 The connector-cable assembly is then secured inside an injection-molded enclosure that provides strength and waterproof seal.